Do you live an active lifestyle? 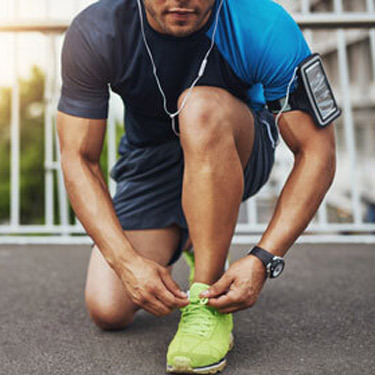 Whether you’re a weekend warrior or professional athlete, you can find the health care you need at San Ramon Chiropractic. As an athlete himself, Dr. Miry understands the unique needs that playing a sport can place on the body. In addition to chiropractic care, we provide Functional Range Conditioning® (FRC®) and performance taping for our active patients. This science-based system is a comprehensive way to train your joints. With years of research behind it, FRC is shown to increase the function of your nervous system. As this improves, you won’t experience injury and pain, and your joint health and longevity will increase. You’ll even find that you can move more freely and easily. Discover what the Houston Rockets, the Chicago Cubs, the Seattle Seahawks and numerous other professional and collegiate teams already know. Rehabilitate as the pros do! If you have pain, inflammation or want to perform at your highest level, Rock Tape® can help you get there. This tape, which comes in many colors, is also known as Kinesio Tape. This tape is composed of a cotton fiber that stretches in length permitting it to move with the body while offering support and stability to muscles and joints without limiting range of motion. You may wonder how performance taping works. It’s thought that the tape pulls on the upper layers of the skin to create more space between the skin and the muscle. The lymph vessels, nerve receptors and blood vessels travel through this space. Creating sufficient space removes pressure off of these structures, allowing for improved circulation of lymph fluid and blood and enhanced nervous system communication between the brain and the body. Rock Tape is effective in addressing back pain, shoulder dysfunction, shin splints and many other concerns. Dr. Miry is certified in Active Release Technique®. You may also benefit from laser therapy and massage therapy, both of which are provided on-site. Contact us today to schedule your appointment!